In 2013, Dog Star Technologies partnered with researchers at Emory University to validate functional MRI in awake unrestrained dogs. This project, funded by a Phase I contract from DARPA, expanded the number and types of dogs suitable for awake MRI. As a result, we confirmed the training and MRI protocol in dogs ranging from a 16 lb Cairn terrier to a 100 lb golden retriever. We also developed the analysis pipeline to handle brains of widely varying size and shape. In 2014, Dog Star Technologies received a Phase II contract from DARPA to prospectively use fMRI biomarkers to predict successful service dogs through a partnership with Canine Companions for Independence. Dog Star Technologies has 3 core values: honesty, integrity, and respect for animals. Respect for animals: we are, first and foremost, dog-lovers. We recognize that dogs are sentient beings with rich cognitive and emotional lives. Dogs are trained with positive reinforcement, and because we never use chemical or physical restraints during MRI, they always have the option to leave the scanner. Co-Founder - M.D / Ph.D.
Gregory Berns, MD, PhD is the Distinguished Professor of Neuroeconomics at Emory University, where he directs the Center for Neuropolicy and Facility for Education & Research in Neuroscience. He is also a Professor in the Economics Department and a founding member of the Society for Neuroeconomics. He is the author of Satisfaction: The Science of Finding True Fulfillment (Henry Holt & Co., 2005) and Iconoclast: What Neuroscience Reveals About How To Think Differently (Harvard Business School Press, 2008), which was named one of the best business books of 2008 by Fast Company. Berns’ latest book, How Dogs Love Us, was published in October 2013 and became a WSJ and NYT bestseller. Dr. Berns specializes in the use of brain imaging technologies to understand human – and now, canine – motivation and decision-making. He has received numerous grants from the National Institutes of Health, National Science Foundation, and the Department of Defense and has published over 60 peer-reviewed original research articles. Dr. Berns’ research is frequently the subject of popular media coverage including articles in the The New York Times, The Wall Street Journal, Money, Oprah, Forbes, The Financial Times, The New Scientist, Wired, Washington Post, and Los Angeles Times. For the last 3 years, Berns has pursued his dream of using fMRI to decode what dogs really think. Partnering with a dog trainer, Berns’ group has trained a team of volunteer dogs to hold still in the MRI. The data they are collecting is revealing startling insights about how our the brains of our canine friends work, and they are finding proof that they really do love us. In the process, they have broken new ground in elevating the rights of dogs. Mark has trained dogs seriously for 25 years. As a competitor, Mark has titled his German Shepherds in AKC obedience, ASCA obedience, and Schutzhund. In the process he has received multiple ribbons, plaques, medals, and placements, including a Regional championship and invitations to prestigious national events. As coach of the CPT Competition Team, Mark has motivated and educated numerous CPT clients owning a wide variety of breeds. In the process, they have achieved victories and placements at all levels of obedience competition. His work in therapy and obedience has been featured on CNN, Noonday, Living in the 90′s, Community and other television programs, plus WGST, 99-X, and B-98.5 radio. 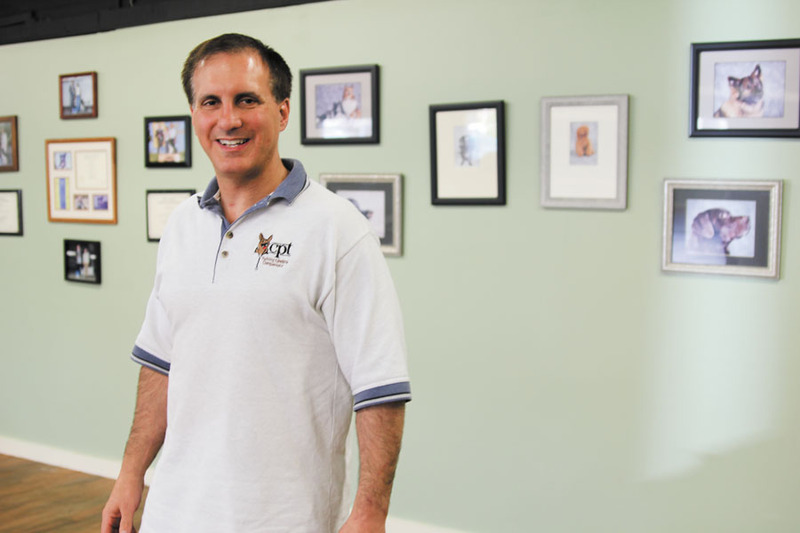 Mark was “The Pet Expert” on the Channel 11 Saturday Morning News and has appeared in multiple segments on canine behavior for Fox-5 Eyewitness News, WGCL-TV 46 Clear Channel News and Comcast TV. Local print media, including The Atlanta Journal Constitution, The Sandy Springs Reporter, The Gwinnett Loaf, The Alpharetta Neighbor and Chai Magazine, and national print media as far away as The Denver Post have featured Mark or CPT. Mark has trained and handled dogs for several television commercials and a music video. Mark and his personal dogs have appeared in a prominent advertising campaign for a large dog food manufacturer and four feature films, Letters From a Wayward Son (starring Harry Connick, Jr., Peter Postlethwaite and Rebecca Carlson), Run Ronny Run (starring Mr. Show’s David Cross), In My Life (a WB pilot), and 2001 Maniacs (starring Robert Englund). Marian Scopa, CPA, MBA enjoyed a successful career in the manufacturing industry, holding positions of Director of Information Systems and Director of Finance, managing numerous projects of all sizes. Pursuing a long-held goal of working with a service-for-a-cause organization, Marian is also a devoted puppy raiser for Canine Companions for Independence, holds a leadership role in the Atlanta Chapter of CCI, and participated in Dog Star Technology's Phase One Project with her own poodle Charley. Andrew earned his PhD in neuroscience from Emory University in 2012, his B.S. in psychology from Mercer University, and is interested in the neurobiological underpinnings of human behavior. In particular, he is working on projects that utilize fMRI to figure out why people behave the way they do during intertemporal choice and decision under risk. Andrew played a big role in building the foundation of Dog Star Technologies. From helping to construct the initial dog headrest prototypes to performing the very first fMRI scan on an awake, unrestrained dog, he has been a passionate contributor to the company. Helen is credited with documenting and assisting in much of the work performed by Dog Star Technologies. Her contributions include photographing training sessions, scans, and providing professional photography for published works that wish to mention the project. When in the project's environment, she uses her passion for and experience with animals to help run successful scans and training sessions.